Real Aloe Vera Gel is made the same today as when we started the business in 1972. If you prefer the gel internally or apply it externally, you will be happy to know you are using the freshest, highest quality California grown Aloe Vera. 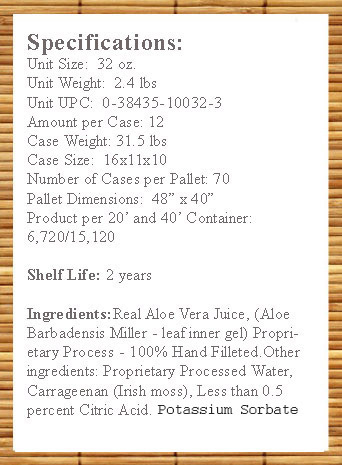 Real Aloe Vera Gel and Juice is bottled in high quality H.D.P.E. plastic bottles. The H.D.P.E. plastic bottles circumvent the plastic taste which comes from the chemical reaction that occurs when you place Aloe Vera in other types of plastic.